Lord Hanuman is the 11th incarnation (Rudra avtar) of Lord Shiva, & is considered as the most powerful & intelligent amongst Gods. His most famous feat, as described in the Hindu epic scripture the Ramayana, was leading an army of monkeys to fight the demon King Ravana. He is also referred to as Bajrang Bali because his body was hard like a vajra. He is also known as Pavan-Putra (son of Pavana) and Vayu-Putra. Hanuman idols makes the place or the surroundings free from rakshasas and 'evils'. Hanuman idols are found on mountain roads because it is believed that he protects people from accidents. 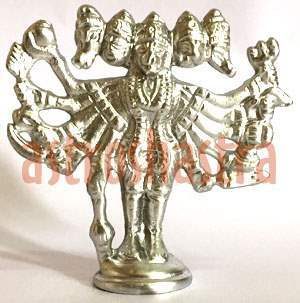 It is very auspicious to keep idol of made of Parad as it is most auspicious. The worship of Parad Hanuman, symbolizes the worship of the Supreme Lord, for acquiring knowledge, physical and mental strength, truthfulness, sincerity, selflessness, humility, loyalty, and profound devotion to the Lord. He the provider of hope, knowledge, fearlessness, intellect and is a symbol of endless devotion. His worshipper is always blessed with pure and unselfish devotion.